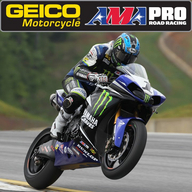 GEICO Motorcycle AMA Pro Road Racing is the premier motorcycle road racing series in North America and is univerally regarded as one of the most competitive road racing organizations in the world. The 2013 schedule consists of 10 rounds of competition on the country’s finest road courses. The Series is comprised of four production-based classes: AMA Pro National Guard SuperBike, AMA Pro GoPro Daytona SportBike, AMA Pro Motorcycle-Superstore.com SuperSport and the AMA Pro Vance & Hines Harley-Davidson Series. The performance characteristics of the motorcycles raced in each division are configured with the intent of providing platforms for riders to compete and hone their skills as they climb the ladder to the premiere AMA Pro National Guard SuperBike division.